Taking care of yourself is essential. How do you expect to help others if your cup is nearly empty? Each day little bits and pieces of our energy is zapped by life's everyday occurrences, jobs, family, personal and intimate relationships. It's like being Iron Man and as strong as he is, he needs to recharge and so do we.. Enough with the people pleasing and caring what others might think of you. Life is tough enough and the matter of your self worth and happiness should be numero uno. The problem with today is we are too busy with social media or other people's affairs that our own affairs take a back seat. It's time to obey this list folks.. 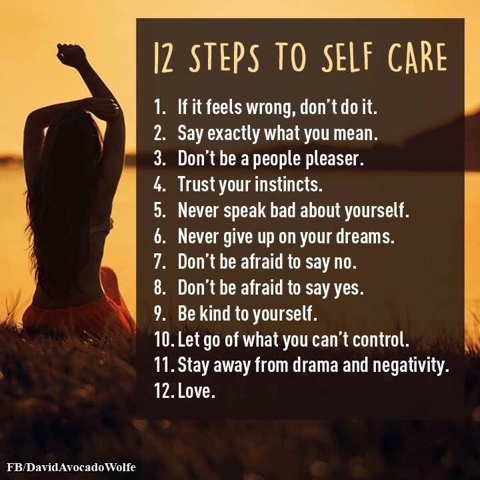 Here are 12 steps to self care and getting your own happiness back on track. Trust me, my life has been a work in progress and I am still mastering this list here but each day it gets easier to reflect when coping with life's obstacles or deflections that try to get us off track. Meditate on this at least once a day and watch your outlook and perception begin to change.